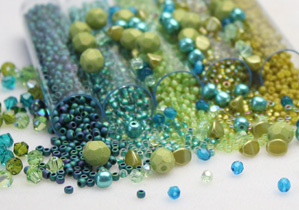 Are you a beading/jewelry perfectionist like I am? Do you want to know how to make the perfect wrapped loop? Faithful readers – continue on! We’ll need some pliers (discussed below) along with some sterling silver wire in either 22 or 24 gauge, and a bead that will fit onto the wire. Side Cutters – these will snip your sterling silver wire cleanly and closely. Round Nose Pliers – These are used for making round shapes and loops. Notice how the jaws look like two ice cream cones – there are no flat edges. This blog post COINCIDES with the VIDEO we made that can be found on our website, Facebook, and YouTube! <— Check them out!! In the first image below, Chain Nose pliers are used to create a crisp 90 degree bend about an inch from the end of our wire. Images 3-5 utilize Round Nose pliers to create our loop by taking that 1″ tail of wire and wrapping it around the round jaw of the pliers. You’ll likely have to shift your pliers slightly to create the entire loop. Remember – you want a loop that looks like a perfect lolly-pop on top of a lolly pop stick! Nice and centered, with that tail of wire maintaining a 90 degree angle. In these next images, Chain Nose pliers are used to hold our loop from, sandwiching it from the the outside, so that way we can wrap the tail of wire right underneath the loop around the main piece of wire. You’ll then notice in image 4 below that I use my Side Cutters to snip off the rest of the tail wire once 3 wraps of been created, one after the other, nicely and neatly. Lastly, in image 5, I used the Chain Nose pliers again to tuck in the tiny sharp edge that’s left behind that the cutters simply couldn’t take off. It’s important not to have any sharp bits that could scratch the skin or catch on clothing! In the images below, I’m using my Chain Nose pliers and then my Round Nose pliers to recreate the earlier steps, only this time after sliding on a bead to my main wire. These steps begin to create our wrapped look on the second side. Grab the wire (as shown in image 2 below) with your Chain Nose pliers and then bend the wire with your hand (do not bend with the pliers) so that way when the pliers are removed you’re left with a space that allows the bead to wiggle up and down slightly. You want the amount of space here to mimic the amount of space taken up by wraps on our first side. Sometimes some trial and error comes in to play in order to get the sides to match – but you’ll get it with some practice! Then, your Round Nose pliers will mimic the same steps as before when your first loop was created, again creating another (hopefully) perfect lolly-pop! Now, below, I’m using the Chain Nose pliers again to grip my loop from the outside so I can wrap my loop closed, with each wrap sitting next to each other and heading closer and closer to the bead. Next, my Side Cutters wil snip off my tail. To wrap up (pun totally intended!) this wire beaded link, my Chain Nose Pliers will tuck in the tiny edge left behind, just as we did on the first side. Don’t neglect this step! And see – the finished product!! To connect links together, simply begin a new link and once the loop is created – but BEFORE it’s wrapped closed – slide the wrapped loop of a previous link into this newly created loop (that’s not wrapped shut yet) just like a key onto a key ring. Then, while the previous link is hanging off of the new loop, wrap the new loop shut and they will be connected together permanently. Keep going, and you’ll be able to link as many beads together as you’d like to create bracelets, necklaces, and earrings! ***For earrings, make sure to use a head pin for the bottom link as a nicely finished earring shouldn’t end with a loop at the bottom – it gives the sense that something was supposed to be there and won’t look completed. This is a fantastic technique to master because you’ll be left with beautifully finished jewelry that’s virtually indestructible – certainly setting your jewelry creations apart from the rest of the crowd! Until next time fellow Beadaholics…!! Previous Post How to Protect and Store Your Beads! Next Post Inspiration Corner! Great Uses for Crystal Mixes!